This city of a million inhabitants is casting off this working-class image and reinventing itself as a cultural capital to rival Moscow and St. Petersburg. According to local legend, the residents of Perm, Russia have salty ears. As an industrial capital near some of Russia’s largest metal and salt mines, workers are said to have once lugged so many sacks of salt on their shoulders into Perm that a briny smudge rubbed off on their skin. Today, this city of a million inhabitants is casting off this working-class image and reinventing itself as a cultural capital to rival Moscow and St. Petersburg. Once a closed city during Soviet times, Perm is now a vibrant urban centre with a rich artistic tradition that has opened its doors to visitors. Direct flights run daily between Perm and Moscow (under $200 round-trip) or St. Petersburg ($250). 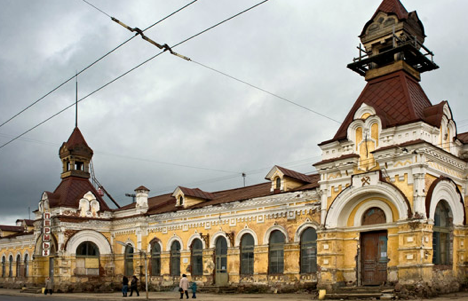 Perm is also situated on the Trans-Siberian Railroad. In the afternoon, Perm-bound trains leave Moscow’s Yaroslavsky Station almost hourly ($50-120 one-way, 20-26 hours). Before Russians started mining salt here, the region was called Great Perm by the Komi, a group of Finno-Ugric people who share ethnic and linguistic ties with Hungarians and Estonians. The Komi lived on the Kama River, which runs through the modern city of Perm, and in the surrounding Ural Mountains, one of the world’s oldest mountain ranges that separates Europe from Asia. In addition to naming one of Europe’s most eastern cities, the Komi also supplied the moniker for an important geologic age, the Permian Period. English geologist Sir Roderick Impey Murchison coined the term after conducting research in the Urals during the 19th century. Murchison’s Permian Period ended with a cataclysmic event that killed nearly all the world’s species known as the Permian extinction. Although Perm’s name recalls destruction, within Russia it has long been a place of opportunity. In medieval times, the Urals represented the beginning of Russia’s ‘Wild East’, a land of untapped resources that attracted explorers and traders as Russia expanded into Siberia. When minerals and precious metals were discovered in the Urals, Peter the Great founded Perm in 1723. The mountains still produce a lucrative export trade in metals and salt. During the Soviet days, Perm was renamed Molotov after Joseph Stalin’s foreign minister and right-hand man, Vyacheslav Molotov. In the Second World War, weapon factories were relocated to Perm further east from the Nazis. Perm got its original name back after Stalin’s death, and the city was opened to outsiders in the final years of the Soviet Union. The Hotel Ural (Ul. Lenina 58) has a great location on Perm’s central square. Rooms start at $100. Today, city planners and local politicians have sponsored large-scale investment in Perm’s cultural life. New theatres and art galleries are sprouting up as construction projects take shape along the waterfront district on the Kama. Visitors here can enjoy ballet and theatre without navigating chaotic Moscow. Hiking and rafting opportunities abound in the Ural Mountains and nearby expanses of northern Asia. The refined culture of Europe and ruggedness of Siberia together form the very essence of Russia; Perm offers both. You can reach most areas of interest in Perm by foot. It’s believed that Boris Pasternak, winner of the 1958 Nobel Prize in Literature, based the town of Yuriatin in his novel Dr. Zhivago on Perm. Pasternak visited Perm frequently and lived nearby for several months in 1916. Start your walking tour of Perm with a visit to the Pushkin Library (Ul. Petropavlovskaya 25) a striking yellow building with a small exhibit about Pasternak in the room that he is thought to have envisioned Zhivago meeting his lover, Lara, in the library of Yuriatin. Close to the library lies another sight referred to in Dr. Zhivago as the “house of figures,” a beautiful blue edifice decorated in white bas-reliefs of female heads and which today houses the local branch of the Russian Academy of Sciences (Ul. Lenina 13a). Just north of Ul. Lenina is the Perm Museum of Modern Art PERMM (Ul. Ordzhonikidze 2). Located in the old river station hall by the Kama, PERMM is famous for its contemporary, and often controversial, rotating art exhibits. Further east along the Kama is the Perm State Art Gallery (Pr. Komsomolsky 4) inside the former Cathedral of Christ Transfiguration. The Gallery houses an impressive collection of paintings as well as wooden sculptures made by the region’s Finno-Ugric peoples. Perm is one of best places in Russia to see ballet and home of the famous Russian impresario Sergei Diaghilev. The city has a museum dedicated to Diaghilev (Ul. Sibirskaya 33), and you can catch a show at the Tchaikovsky Theatre of Opera and Ballet (Ul. Petropavlovskaya 25), originally founded in part by a donation from Diaghilev’s grandfather. Outside the city is Perm-36 the only gulag in Russia that is formally open to visitors. During the repressive Stalin years, thousands of dissidents and intellectuals were sent to gulags, or labor camps. Coils of barbwire fence still surround Perm-36’s original buildings; concrete cells where prisoners were jailed, and a new museum. A visit here is a moving journey through one of the country’s darkest eras. The Perm Tourist Travel Agency (Ul. Lenina 58, inside The Hotel Ural) and other local outfits lead tours to Perm-36 that run upwards of $100. Alternatively, the museum’s website contains valuable information on how to organize your own transport and book a cheaper guided tour through its Perm office (Bul. Gagarina 10). Perm is also gateway for rafting, trekking, skiing, and horseback riding adventures in the Urals. Tour operator Krasnov can help you embark on any of these outings. Their 7-day rafting expedition ($750-1,000 depending on group size) is highly recommended. Perm’s calendar is chock-full of festivals. The White Nights festival features a month of art and concerts every June when the Russian sun hardly sets. The Kamwa Festival starts every July and is both a celebration of modern art and music as well as the artistic traditions of Perm’s native peoples.